Homemade banana bread is one of those things that I can never get enough of. I love making it and almost all the bananas that enter my house get baked into a batch. 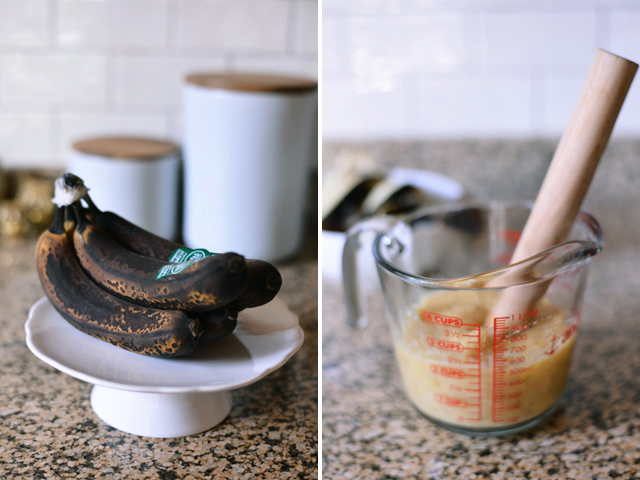 There are a lot of great banana bread recipes out there, but my current favorite is this recipe from Alexandra’s Kitchen, which I like to make with half the amount of bananas. The original recipe calls for a whole quart of mashed bananas, but I cut it down to 2 cups. My version proves that less can be more. By adding fewer bananas, the resulting banana bread is lighter both in color and texture. The bread is golden and almost cake-like instead of being the dark and dense treat that I normally associate with banana bread. 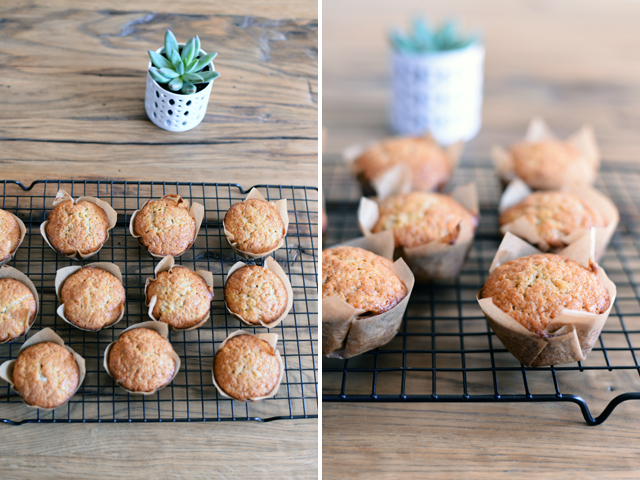 I usually bake this banana bread in mini-loaf pans (you can get 5 mini-loaves from this recipe), but I wanted to try making parchment paper muffin liners so I made this batch into muffins instead. The DIY liners (instructions are included below) turned out so charming that I don’t think I’ll ever want to use store-bought ones again. 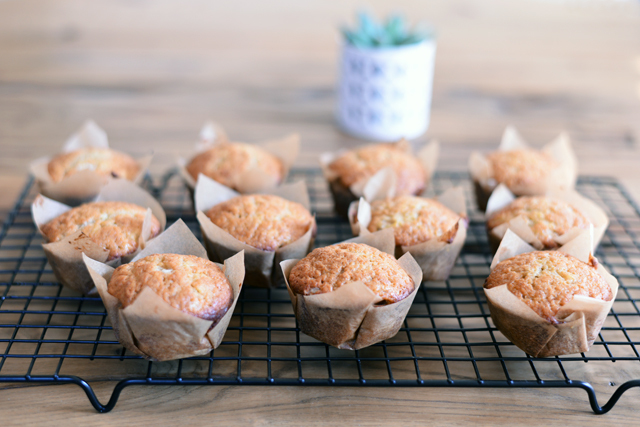 The muffins are also perfectly portioned, so if you are anything like me, it will keep you from polishing off a whole batch of banana bread in one sitting. Preheat the oven to 350 degrees. Line a muffin tin with muffin liners or parchment paper (see instructions below). In a medium bowl, whisk together the flour, baking soda, and salt, and set aside. In a stand mixer fitted with the paddle attachment, cream the sugar and butter together on high until light and fluffy, about 3 to 5 minutes. With the mixer on medium speed, add the eggs one at a time, beating well after each addition and scraping down the bowl as needed. Then add the bananas, buttermilk, and vanilla, and mix to combine. With the mixer on low, slowly add the reserved dry ingredients and mix until just combined. Using an ice cream scoop, scoop the batter into the lined muffin tin. Bake for about 30 minutes, until lightly golden on top and a tester inserted in the middle of a muffin comes out clean. Transfer muffins to a wire rack to cool. Enjoy warm or at room temperature. Cut a sheet of parchment paper into 4 to 5-inch squares (they don’t have to be perfect). Take the drinking glass and use it to lightly press a square of parchment paper into each cup of the muffin tin. Try your best to mold and fold the parchment paper into the muffin cups with the help of the glass. Keep in mind that the parchment paper may not mold to the cup completely until filled with batter. I could eat banana bread all day long! Love the idea of these mini versions and also baking it in miniature loaf pans. I’d be tempted to throw in a few chocolate chips too, although sometimes plain and simple is best! Ooo! Thanks for the DIY liners… I’m definitely trying them. Like you, I’m a lover of a lighted banana loaf. Great recipe. The drinking glass! That’s the trick! A couple of years ago, I made parchment liners quite simply because I was out of the pre-made ones. I loved the look but ended up with some odd-sized muffins because the parchment didn’t mash down all the way into the cups. I never thought of using a glass! Brilliant! And the recipe looks great too…. Out of necessity, I swapped one of the cups of sugar for a half-cup of brown; ended up just as light in texture, with a deeper, more familiar banana bread hue. Threw some ground cloves and a few turns of cinnamon in there, too. Delicious. Thanks, Connie!